The idea, which became the Essential 5, came from a great friend and fellow National Kagan Trainer, Rob Jutras, and of course from Dr. Spencer Kagan whose visionary ideas have done so much to develop education, and in particular, the field of Cooperative Learning over the last three decades. "Which Kagan Structures should I learn and use first? ", and "Where do I begin?" In response to these questions and, "Necessity", as the saying goes, "being the mother of invention" Rob and I got to talking about how best to serve these colleagues. The result is our Essential 5, a personal list of fabulous Kagan Structures to be used very much as a starting point to understanding Kagan Structures. I hope you find the list useful, and of course it goes without saying, I rely on you using this list as a springboard to accessing and learning much, much more about Kagan Structures in the future. 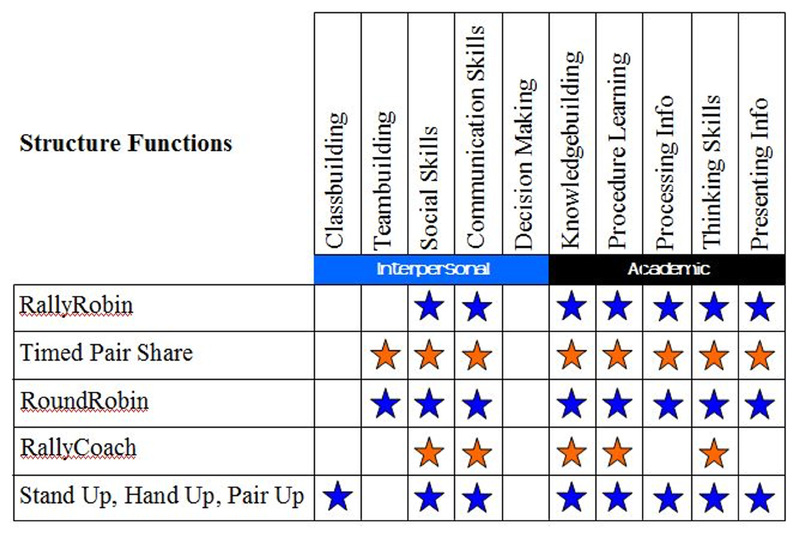 The Structure Function table here illustrates that Kagan Structures fit into multiple categories. For example, we can use RoundRobin for Teambuilding, the process by which students get to know, respect, value and like their teammates. RoundRobin is also extremely useful for Knowledgebuilding, students interact with each other to review or memorize stuff to know. As you look across the other functions, you can see that RoundRobin is also great for practicing procedures, processing or presenting information, and for developing and engaging a range of thinking skills. In traditional classrooms, teachers have students work alone. They don't have the chance to learn to work well with others and to manage their own emotions while in interaction with others. At the very same time that students are, for example, reviewing content; Cooperative Learning Structures, i.e. 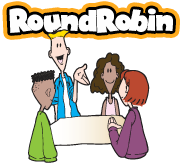 RoundRobin, have the students interact with each other in ways that help them to acquire social skills, character virtues, and emotional intelligence. The list of structures is long, there are many "tools." The skill of the teacher is selecting the right tool for the right job. If we continue the tool analogy we wouldn't use a hammer for sawing. With Kagan Structures we don't want to use a high-consensus structure for developing divergent thinking. To learn more about Kagan Structures read Kagan Cooperative Learning by Dr Spencer Kagan, in particular Chapter 6 on Structures and Functions. Of the 250+ fabulous Kagan Cooperative Learning Structures, what then is the least number of Structures one could learn and still be able to cover all possible types of questions, functions and situations in the classroom? (*With the exception of Decision Making.) Below is our Essential 5. Rob and I can't think of a better 5. Once you are familiar with Kagan Structures, you may decide on a different set of structures. That is the beauty of these "tools"— they allow you, the teacher, to be creative and develop your own lesson designs! 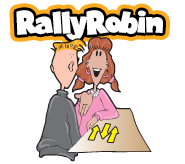 Teachers that use just RallyRobin and Timed Pair Share can make a huge difference in achievement and engagement and can take their students a very long way simply instead of "calling-on-one." Along with higher academic achievement you will also see a reduction of the gap between high and low achieving students, improved social skills and cooperativeness, improved self-esteem, increased liking for school and learning, improved classroom climate, decreased discipline problems, increased leadership and employability skills, improved conflict resolution skills and increased empathy and concern for others! In pairs, students alternate generating brief oral responses. • List adjectives to describe the character. • Share steps of the experiment. • Describe an event from the story. 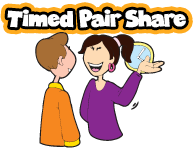 In pairs, students share with a partner for a predetermined time while the partner listens. Then partners switch roles. • What is the key thing that you learned? • What is one literary technique you plan to use in your writing and how will you use it? In teams, students take turns responding orally. • What makes a good listener? • List objects that float? • What clubs or societies are you a member of? • What is one of your favorite movies? Partners take turns, one solving a problem while the other coaches. Then partners switch roles. • Useful for any process or procedure with a definite right/wrong. • Solve multi-step word problems in math. • Change each decimal into a simplified fraction. 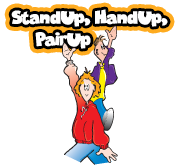 Students stand up, put their hand up and quickly find a partner with whom to share or discuss. This structure is perfect for classbuilding, processing and reviewing information, energizing the class, forming random pairs or teams, lesson starts or wraps. Of course it goes without saying, this Essential 5 is in no way a substitute for completing a multi-day Institute on Kagan Cooperative Learning. Participating in a multi-day course will show you how to build powerful learning teams in your classroom. 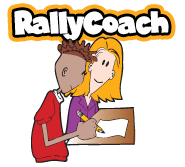 You'll learn Kagan methods for teambuilding, classbuilding, classroom management, dozens more Kagan Structures for mastery, higher-level thinking, and social skills. Kagan Institutes are extremely practical, hands-on classes packed with great ideas all grounded in sound research and theory! Gavin Clowes heads up Kagan UK, an organization dedicated to bringing Kagan Structures and methods to United Kingdom teachers and schools. Thank you to Rob Jutras for inspiring me with the initial idea for this article. I came across Ron Clark's story, and book, The Essential 55 an approach that saw Ron create a visible and lasting improvement in students' behavior and manners. After hearing about Ron's passion and his students' gratitude for what he had taught them I wanted to do the same for Kagan Cooperative Learning Structures, hence my reworking of his title. • Kagan, S. & Kagan, M. Kagan Cooperative Learning. San Clemente, CA: Kagan Publishing, 2009.